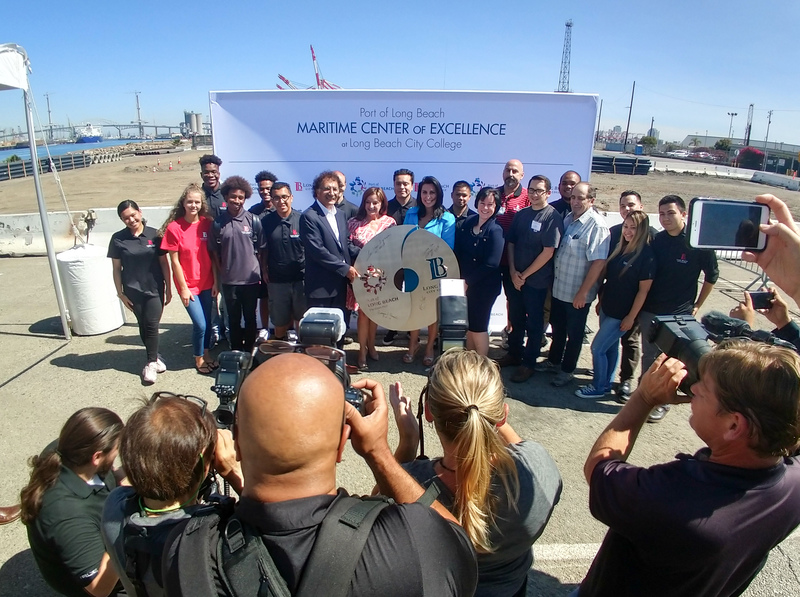 Long Beach Port and Long Beach City College officials pose for photos at the launch of the new Maritime Center of Excellence on Wednesday, August 8, 2018. The metal sculpture was made by LBCC Metal Fabrication Technology students. Photo by Valerie Osier. After just a few months of training, Long Beach City College students could be on their way to a career at the Port of Long Beach thanks to a new partnership. The Maritime Center of Excellence, officially launched Wednesday, is part of an effort to help the port get qualified candidates for in-demand supply chain jobs. “These kinds of opportunities can really change lives,” said Lou Anne Bynum, president of the Harbor Commission that approved the $60,000 contract with the college. A recent report from the Los Angeles County Economic Development Corporation estimates the logistics industry will need 69,910 replacement workers over the next five years. LBCC already offers programs for port jobs, like a 12-week commercial truck driver training program and a cyber security certification, but the center will unite the programs. During the pilot year, which will end in July 2019, officials plan to have created and tested up to six new training workshops. The workshops are still being developed, but officials hope to offer the short-term training workshops as soon as possible, possibly as early as the spring. “Obviously employers can’t wait three to five to seven years for us to produce students who become the workforce of tomorrow, we have to start that today,” said Sheneui Weber, the chief operating officer of the College Advancement and Economic Development at LBCC. While the contract expires next summer, officials are optimistic the commission will renew it after the center’s success has been measured through how many students complete the short-term certificate programs. The partnership also creates a “boot-camp” for 25 students from Cabrillo High School’s Academy of Global Logistics to learn more about potential jobs. In addition, it will create five new supply chain and logistics related internships for LBCC students. The long-term goal of the partnership is to create pathways from high schools to LBCC, then to either the workforce or Cal State Long Beach.